This week we got together to celebrate Charlize Theron's busy month of June. But first we read lots of great listener feedback, discuss St. Elmo's Fire, Reality Bites and Haywire, plus announce the results of our last Lunchtime Poll and discuss this week's new question. About halfway through recording we ran into audio issues, so we apologize for those in advance. 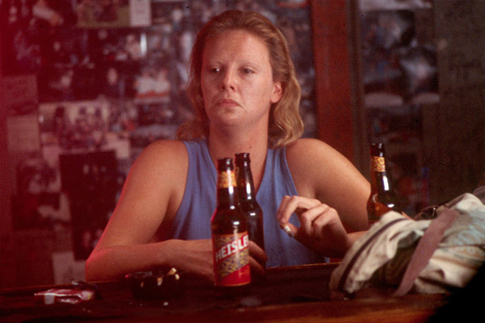 Jess' Pick: Monster - Charlize won an Oscar for her role as serial killer Aileen Wuornos. She uglied herself up, wore false teeth, took on a masculine posture and mostly used a southern accent. Other than barely being able to talk around her teeth, she did a good job - unrecognizable as a gorgeous former model-turned actress. But I HATED this movie. As a biopic, this is fairly well crafted in that it looks at just a few of the major events in her life that led to her life of crime. That's about all I can say that is positive about the film. Christina Ricci as Aileen's girlfriend is horribly annoying. The violence is particularly overdone - frequent violent and particularly graphic rapes, beatings, and then Aileen's murder streak and her total lack of humanity about it all. I don't think this person deserved a second of our time on film, and I recommend anyone who hasn't seen this avoid it at all costs. 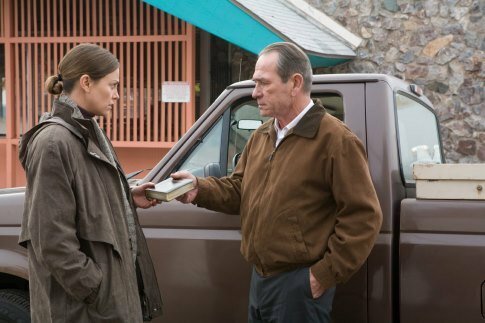 Rachel's Pick: In the Valley of Elah - In one of the saddest "coming home" stories, Theron, a local detective, partners with Tommy Lee Jones, a former military police officer, to determine how his son was murdered after he returned home from war. The two have amazing chemistry as both persons of the law and parents. Charlize downplays her beauty, without overdoing the makeup or butch attitude, like in Monster, and gives a wonderfully subtle performance of a struggling female detective and single mother trying to solve a murder mystery with loads of opposition in her way. It's probably the best film on her resume. Duly noted. I will (keep on) avoiding Monster, and I wish that Elah was available on Netflix. I'll have to do with adding Aeon Flux to the instant queue. I wasn't quite as impressed with Aeon Flux. I liked the sci-fi concept but not the execution. Elah is a seriously good film. I was really surprised how much I liked it. Me too! Especially since I typically loathe "soldier coming home" films. This one took a different approach that really worked. I caught your show about Miss Theron and very much enjoyed it. You gave me some titles that I have not seen but will check out. As for the movie "Monster" were you just turned off by the subject matter or was it her performance. The violence can be a bit rough, but it was important to the story. Simply telling people about it would not have the same emotional impact. When Aileen first gets attacked, and she fights back. I felt she was justafieable in her actions. But as time goes on her reasons for justice become more and more skeward to where she is just killing for no reason. It was brave of Charlize to play that character in a sympathetic manor because if she just acted all crazy and sinister. It wouldn't have been beliveable. Check out my post about Charlize Theron including some titles that were not discussed in this episode. I didn't have as much of an issue with the violence in Monster as Jess, and agree that most of it was necessary to show the progression of her character. And aside from the false teeth that clearly gave her difficulty, I thought Theron's performance was fine, if not a bit over the top in a few parts. My biggest issue with the film was how it victimized a serial killer. I'm not heartless and certainly think the first killing was justified due to self-defense, but afterwards it was hard to watch due to following her character on a murder spree. I had no idea that I 1) Have seen so little Charlize Theron movies and 2) Have seen so many that I have totally forgot about. Not sure if it was her performance or the films that I did see, but I could only think of four movies I had seen with her in it - Hancock, Devil's Advocate, Italian Job and one you didn't talk about That Thing You Do. But, I apparently have also seen her in 15 Minutes, Sweet November, Legend of Bagger Vance, Men of Honor and her voice in Astro Boy. Wow, I always thought I liked her, but I find it odd I can't remember her in almost anything I have seen her in. But, thanks to some of your thoughts I will definitely be adding a few to the queue now. Nice job as always. We did briefly brush over That Thing You Do, which Jess remembered her in, but I couldn't, but since it was such a minor part only one of us could remember, I just cut out the discussion for time's sake. Same with 2 Days in the Valley. Skype cutting in and out also contributed to that. I like and respect Theron. She's willing to take risks at least, even if they don't always pay off. Good show. I really dislike Monster and North Country, but I do agree that Theron does a good job in both cases. It's easy to write her off as just another pretty face, but I think she has talent. I wouldn't say there are a lot of movies that I love within her career, but that doesn't usually relate to her acting. I'm curious to see how she does in Prometheus (and the upcoming Mad Max sequel, apparently). She's also great in Arrested Development, and her recent role in Young Adult was impressive. Thanks, Dan! Like I said, I'm impressed by Theron because she could've easily been typecast as just a pretty face in a plethora of crappy rom-coms, but avoided just an awful and really challenged herself with difficult roles. She's never afraid to downplay her beauty to be taken seriously, but doesn't cast it off either, and for that I admire her, even if I don't always care for her films. However, that being said, these two summer releases she's had have been very one-note bitchy roles which saddens me, because I know she can do better. She looked like she was having fun as the evil queen in Snow White, but practically phoned in her Prometheus performance.